There are a lot of things that I could write about at the moment, especially considering that we have finally started our camp program this week. I should also probably be sleeping. But all that I really want to do right now is talk about three flowers. Today was our second day of camp. At the end of the afternoon session, one of our older campers was hoping for someone to come and pick her up since she lives fairly far from the school. She was still waiting after we had finished cleaning up, so we told her that we would keep her company and walk her home. We had to pick up camp snack from the Northern Store anyway, the weather was gorgeous, and we welcome pretty much any opportunity to see more of the community and get to know the people here. In our first five minutes of walking down the road from the school, two campers from our morning group spotted us and decided to join us. They seemed to be really enjoying biking far ahead of us and either showing us how quickly they could bike down the hills around us or how well they could skid their bikes to a stop without falling off. They were full of questions and gave us quite the detailed play-by-play of everything that we saw along the way. But more than that, the conversation that we had was incredibly genuine. We have known these kids for only two days, but they were completely comfortable just hanging out and chatting with us. On our way back, our two younger friends on bikes continued to keep us company and we were joined by a few other kids who walked with us for a while as well. They raced us, let us ride their bikes, and could not stop talking about playing tag (I have never met a group of kids so entertained by the game). And along the way, the two younger boys stopped and picked three flowers for me. After dinner, one of the boys came to our door and asked us to play tag. We were tired, but agreed to join him out on the playground. The sound of the three of us laughing – an 8-year-old, a 21-year old, and a 26-year-old – is something that I am not going to forget anytime soon. I am not quite sure how to describe it and I certainly do not want to sound overly-dramatic, but it was something special. For thirty minutes tonight, we climbed to the top of the playground, ran as fast as we could, hid in tunnels, and laughed. For thirty minutes tonight, I let myself feel like a kid. And it was incredibly refreshing. 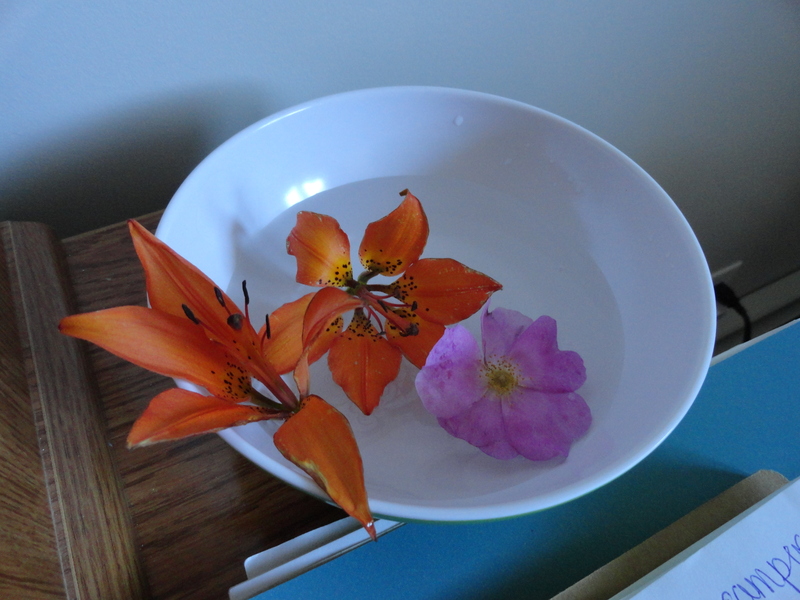 I have put my three flowers in water and am hoping that they will last at least a little while longer… a small attempt to hold on to the feeling of a pretty great day. This entry was posted in Fort Albany and tagged First Nations, Fort Albany, Frontier College, Lieutenant Governor's Aboriginal Summer Reading Camp, Northern Ontario on July 3, 2014 by nicoledalessandro.